Surimi is one of my favorite snacks and for a very long time I wasn’t able to get hold of surimi in India. This changed when a brand here started to sell these delicious crab sticks in the grocery shops in Goa. The day I discovered surimi in my favorite store, I bought it, and the cashier asked curiously what they were and how I used them. I figured, surimi needs something like a formal introduction in India. Therefore I am sharing today a simple and quick 10 minute surimi salad with curry mayo dressing, so that you get to know this fantastic snack and ingredient. Before we get to my new favorite salad recipe, I would like to explain what surimi is. The most common surimi type in this world, and the one used in this recipe post, are the processed crab sticks. Besides the crab variation exists also fish and meat surimi. The orange shaded crab sticks mostly contain a mixture of fish, lobster, oyster and crabs. According to wiki, the sea food is washed a gazillion times, beaten and pulverized to create a fine paste. Some people might argue that surimis are not exactly the best food, but some of them eat other processed foods and of course pink sausage slices, so I don’t see why I should pretend to be a hypocrite when I like to enjoy surimi occasionally. Surimi is not a contemporary food invention. The practice of drying fish ingredients and turning them into a paste seems to have originated around China and Japan centuries ago. Nowadays, surimi are popular all over the world and most probably if you have enjoyed sushi, you will have come across surimi. I noticed a difference in surimi quality and the way they were packed and stored in France, Austria and India. The surimi sticks in Europe break apart much easier and the flavor intensity is way less. They pack the surimi in pairs and store them in a regular fridge. Currently, you will find surimi in India in the freeze departments, tightly vacuumed with a thick and strong packaging. The crab sticks themselves are much more flavorful, which I and my husband prefer and they don’t fall apart that easily compared to the European surimis. I hope the quality will remain that way in India! I discovered surimi as a child back at home in France. It’s a very popular snack in France and it’s that common there that people have successfully incorporated surimi in salad recipes such as the North African tabbouleh. This year I even came across big packs of orange surimi crab sticks sold together with a mayo curry dip. It was a scourging hot summer day and before we traveled to the Fort Mahon beach in Picardy, we stopped at a supermarché to buy our picnic beach lunch. We grabbed a few surimi packets, drove and took over a spot on the beach before we completely enjoyed the surimi. At the beach I got the ingenious clairvoyant idea to turn the curry mayo dip into a surimi salad dressing. Surimis are enjoyed as they are, you don’t cook them further. You can just dip them into a fitting dipping sauce such as a yogurt lemon dip or a curry mayo dip. You can cut them into thin stripes and make a sandwich (if you want I have a great recipe for that too), or add to raw salads or simply create a surimi sushi. 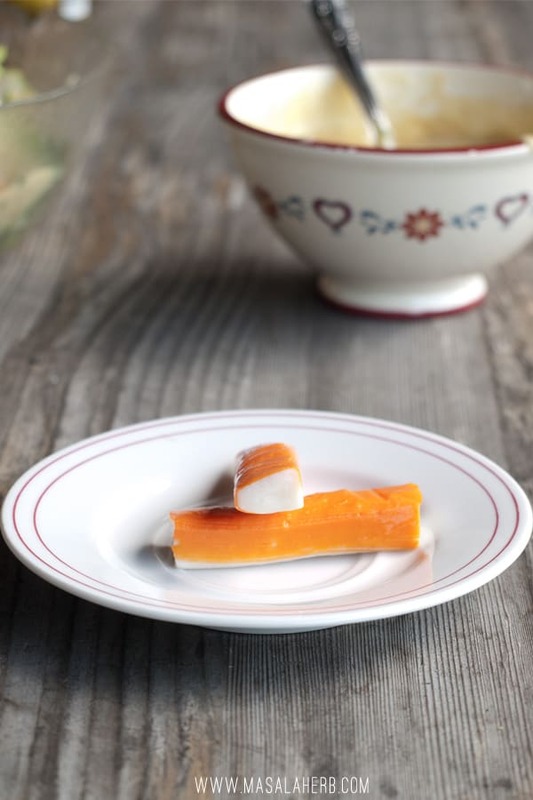 Crab sticks are versatile and they can enhance the flavor dimensions of a dish 3 folds. If you enjoy fish, prawns and crabs, and you are curious, you will enjoy this surimi salad with curry mayo dressing too. My Goan husband loves them too and he keeps on asking me to buy them and add them to our lunch. Westerners as well as Indians will enjoy this recipe due to the addition of curry powder, which makes it all the more exciting. 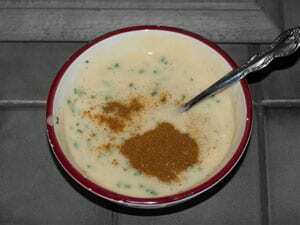 To make the Curry Mayo Dressing, simply create my 5 minute homemade mayo and then add the curry powder and mix it well. For the salad; first rinse, dry and clean the lettuce leafs from any impurities and shred into bite size pieces. Rinse and cut the tomato into half and into thin slices. Rinse, peel and cut cucumber into slices as well. Unpack the surimi and cut into smaller pieces. Toss everything together and cover and mix with the curry mayo dressing. Enjoy your salad. Do you have a favorite dish with Surimi crab sticks? A lovely salad! I love curry mayo. Surimi can have really great flavor! I love using it in Crab Rangoon. Had no idea the product was as old as it is, though — great info. And a really nice recipe. I’m with Rosa — curry mayo is such good stuff! I’d seen this in Europe but didn’t know what it was. I learn nifty things from you, Helene! love the dressing I could use that on so many different things! It looks like a very delicious salad. Curry mayonnaise sounds fantastic! I also like surimi and this salad looks delicious. what a beautiful and enticing looking salad Helene. I think surimi is better known as crab sticks in this part of the world. A perfect, satisfying choice. 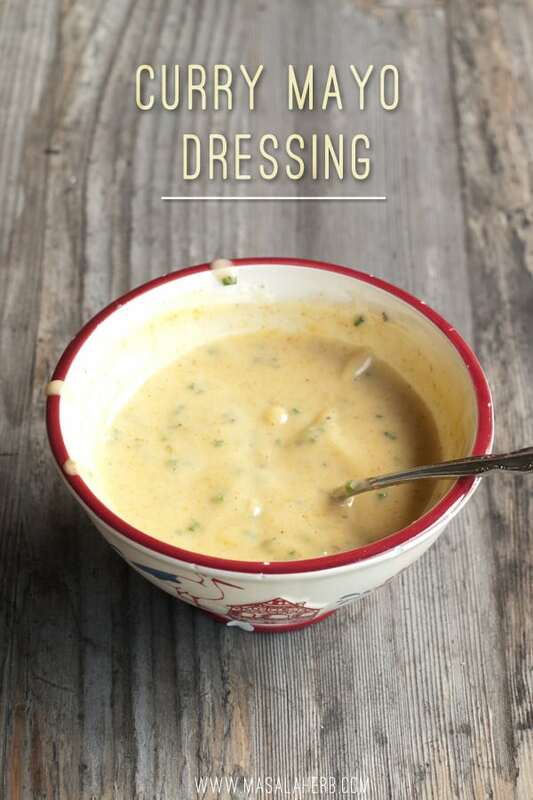 Your curry mayo dressing has got me all aflutter – gorgeous idea! Now that I know what surimi is, I will admit that it is a product that I have always avoided. My few experiences with it have not been good. However, I have been seeing it more and more in quality fish markets. The simplicity of your healthy salad is perfect for this time of year when many of us need a break from all of the heavy preparation foods and high calorie foods. I’ve had curried crab dishes in Asian restaurants, and it is a combination that I love, so looks like I’ll be giving surimi another chance. Thanks! Mj, are you allergic to crab meat? Because my husband is but he has no problem eating surimi, thank god because he loves the crab sticks. Mouth watering salad. Looks yummy. Well, having a French husband we do make mayo from scratch but have never made it with curry. What a delicious idea for this kind of cool lunch, perfect for summer. No, I could actually eat it in winter, too. And yes, I love surimi too. 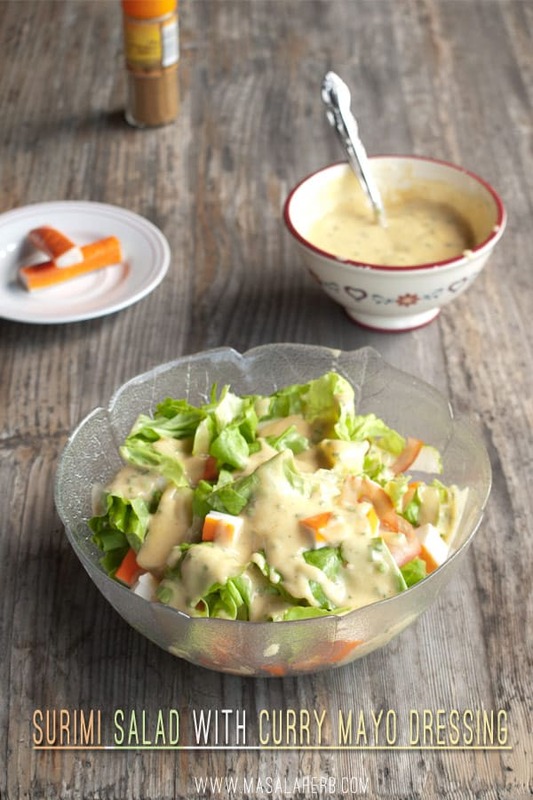 Hi, this may be interesting you: Surimi Salad with Curry Mayo Dressing!